Meteorologists see signs that this winter's "Godzilla" El Niño is weakening ever so slightly, but they caution months will pass before people in the Americas will feel it. In Southern California, there are signs that El Niño's impact is at least temporarily receding. Heavy rain and flooding last month, fueled by one of the largest El Niños on record, has given way to an unusually hot and dry streak with temperatures running 15 to 25 degrees above normal. But meteorologists say that doesn't mean the threat is over. "It's still strong, but it has reached a peak value and it's starting its decline," said University of Oklahoma meteorology professor Jason Furtado. "It's still there; it's not like we don't have El Niño anymore. 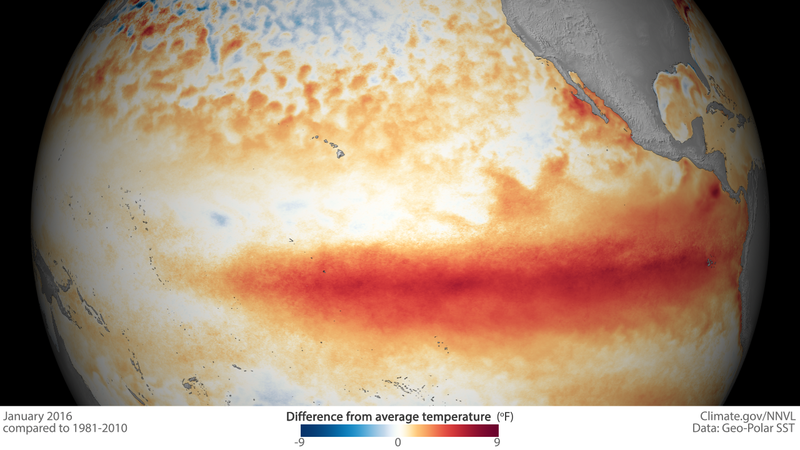 We can still expect (El Niño) like conditions in March and April and even into May, as well." NASA climatologist Bill Patzert, who came up with the "Godzilla" nickname as the strength of the current El Niño emerged, told CBS News the system remains "immense." "It's had a powerful impact over the last six months, and even this winter, all the volatile weather we've had across the United States -- the fingerprint of El Niño is on all these events," he said earlier this week. Its impact is also being felt far beyond the United States. El Niño is contributing to scorching heat and drought in southern and eastern Africa. CBS News' Debora Patta reported this week from Lesotho, where what should have been the rainy season is instead bone dry, decimating crops and putting millions of people at risk of starvation across the region. Heading into the spring, NOAA forecasts weather conditions for the U.S. that are wetter than normal throughout the South, much of the West and part of the East. Only the Great Lakes region and Pacific Northwest are forecast to be dry. It also predicts warmer than usual weather along the entire West Coast and most of the country north of Colorado, Missouri and Tennessee, with only Texas, parts of Oklahoma and New Mexico cooler than normal. The International Research Institute at Columbia University forecast that once this El Niño fades, there's a 50 percent chance it will be followed directly by El Niño's flip side, a La Niña. La Niña often means droughts in parts of the Great Plains and Southwest with more rain in the Northwest. La Niñas often mean warmer winters in the Southeast and cooler winters in the Northwest.